With the arrival of Fall our gardens and landscape begin their transition for the winter. This presents a great opportunity to prepare your landscape for the upcoming winter and even for next Spring. Fall is a good time to select and plant trees and shrubs. Fall planting encourages good root development, allowing the plants to get established before spring. If weather is dry, provide water up until the ground freezes. 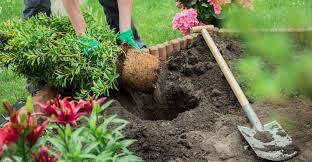 As the weather cools, perennial flowers that have outgrown their space can be dug and divided, or moved to a new area of the garden. New or replacement perennials can also be planted this month. Mark your perennials with permanent tags, or create a map showing their locations so you’ll know where and what they are when they die back. This will help you to avoid digging up something you intended to keep later. Winter pansies, flowering kale, flowering cabbage, and fall mums may be planted now to brighten the garden when summer flowers fade. Feed evergreens and deciduous trees with a tree and shrub food. This product contains slow-release nitrogen, sulfate of potash, iron and other micro-nutrients for overall plant growth and development.